All Port Power DC Passing 2 GHz 8-Way Digital Splitter!!! 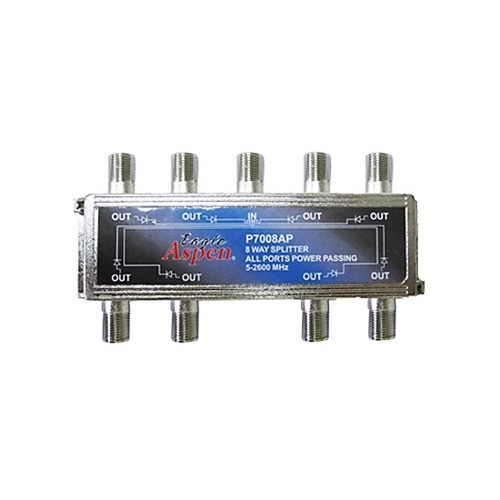 8-way UHF/VHF all port DC power passing digital splitter. Can be used as a splitter or combiner. The 8-Way Splitter is a cost efficient dependable splitter designed to work in the range of 5 - 2600 MHz. These devices come in a high quality Diecast case with machined F-Ports. The mounting tabs come with screws and grounding port. All port power passing, Internal circuit board, Shielded housing. Multiple capacitor design for improved signal response.